Great news - Magnum's 'Design Your Own Magnum' Pleasure Store is back for the 5th year this summer 2018 in a new location in Chelsea. It's at 11-13 Duke Of York Square, just off the King's Road, and round the corner from the Saatchi Gallery, and is now open daily until 16th September 2018. This year, along with the usual 'design your own' bar, there will be events (inc an Instagram masterclass), plus a special 'Chef's Table' with bookable sessions where you can truly indulge your passion for Magnum. Go! 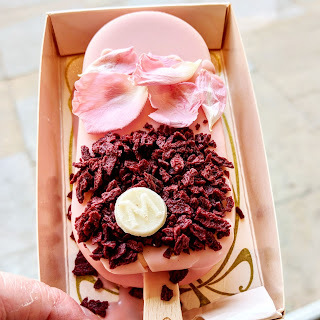 "Magnum ice cream, the brand synonymous with pleasure and luxury, has today opened its gates to a haven of cracking chocolate and velvety ice cream with the return of its world-famous Magnum Pleasure Store – this year, located in London’s glamourous borough of Chelsea. 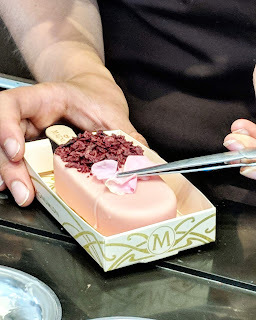 The Pleasure Store embodies and celebrates Magnum’s attitude to Take Pleasure Seriously and showcases its position as an expert in luxury ice cream craftsmanship. Magnum invites you to experience ultimate pleasure and sophistication with the return of its iconic ‘Make My Magnum’ dipping bar, where Londoners can customise their own eye-catching ice creams, crafted in-store by Magnum’s expert Pleasure Makers. The bar features an array of dipping chocolates and sumptuous toppings, meaning everyone can find a unique indulgence just for them. Also introduced this year, consumers will be able to decorate their Magnum with the finishing touch of a special initial chocolate coin. Pleasure Seekers can also choose from a range of fabulous new Magnum ice cream ‘looks’, specially crafted and inspired by the world of fashion and art - all recipes are the epitome of the Magnum core value of Taking Pleasure Seriously. Make My Magnum ice creams start in-store at £5.50. A brand new feature launched at this year’s Pleasure Store sees the addition of the Magnum Chef’s Table, giving pleasure seekers the VIP experience of getting hands on and dipping, and crafting, their very own indulgent creation – also giving consumers the chance to discover more about the craftsmanship that goes into each Magnum ice cream, from bean to bite. Alongside this, for the first time, the iconic Magnum Pleasure Store ice creams will be available to order on Deliveroo throughout the summer in selected postcodes, for you to enjoy indulgent in-store experience from the comfort of your own home. All of this is set in the beautifully decorated bold art-deco style Pleasure Store, in the classic Magnum gold and brown colours to remind visitors of Magnum’s timeless link to pleasure. In addition to offering London’s most fabulous ice cream, the store will also be a hub for diverse events and masterclasses, inviting London’s pleasure seekers to learn how to take pleasure seriously. Its programme includes the likes of a photography Instagram masterclass hosted by the widely celebrated Humphrey & Grace. Please visit www.magnumicecream.com/uk/pleasure-store.html for the full itinerary and ticket information."